Independent observers from UCL have hailed Somaliland's presidential election as a 'peaceful expression of the popular will'. Somaliland declared unilateral independence from the failed Somali state in 1991 and has been a haven of relative peace while violence and instability has characterised Somalia, its capital Mogadishu and more recently the Gulf of Aden. The Development Planning Unit (DPU) at UCL was one of three organisations invited to act as coordinators of the observation mission for the election in the internationally unrecognised republic. UCL staff together with colleagues from Progressio and Somaliland Focus (UK) were among 78 international observers who visited polling stations in all six regions of Somaliland during the election, which has been repeatedly delayed. The poll has previously been scheduled for March/April 2008, December 2008, March 2009 and September 2009. The observers reported great enthusiasm among the majority of Somaliland's electorate, particularly from female voters, and a high turnout in many areas despite threats from Islamist militant groups to disrupt the process. Michael Walls, from the DPU, said: "We were very impressed with the spirit of the campaign and also the enthusiasm of people in most (though not all) parts of Somaliland. In that light, I'd say that the election has helped to 'institutionalise' this representative system of democracy." Mr Walls said the votes were being tallied and he hoped all parties would accept the final numbers when they were announced, which could be as early as Wednesday 30 June. He added: "Procedurally, we feel it provided the basis for a largely free and fair expression of the popular will. If the process comes to its conclusion in a similar spirit, then we believe it will have been a credible and legitimate vote. "That said, there were some issues which we have referred to the National Electoral Commission for consideration. The two most serious were numerous instances in the town of Borama in which members of our international observer teams witnessed voting by children considerably younger than the legal voting age of 16, and the confiscation and stuffing of ballot boxes in the eastern areas of Sanaag, around the districts of Badhan and Dhahar. "This covered areas in which some 15,000 people were registered to vote, so by sheer weight of numbers, the action could affect the final outcome. The NEC is reviewing this situation and we have full confidence that they will arrive at an appropriate decision." For more information about the DPU, follow the link above. 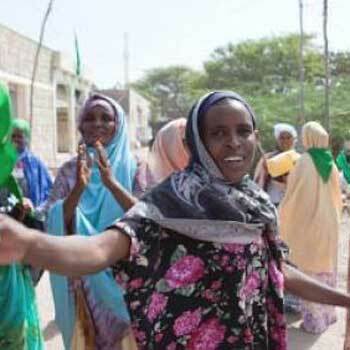 Image: Female voters in Somaliland taking part in the presidential election (credit: Claudia Simoes). The DPU is an international centre specialising in academic teaching, practical training, research and consultancy in the field of urban and regional development, planning, and management. It is concerned with promoting sustainable forms of development, understanding rapid urbanisation and encouraging innovation in the policy, planning and management responses to the economic, social and environmental development of cities and regions, especially in Asia, Africa and Latin America.